We booked this tour, for being 5 hours. We drove for 1 hour, which is really nice to see the countryside. We then assumed that the tour would be 3 hours, and then the return drive another hour. Unfortunately, this was not the case, on arrival, we noticed a lot of people had towels and swimwear, which was not in the tour explanation. On boarding the boat we were told that we would be going to the bat cave, not mentioned in the Viator Itinerary, but it was ok. We then visited a local fish farm, we were told we had half an hour, this went onto 1 hour, with everyone just sitting looking at each other. We then did the eagles and onto another fish farm, for a lovely lunch. We were then informed we were going to a beach for activities, this was not in the Viator itinerary, it was hot we had no swim gear, and we had told our family it was only a 5 hour trip and to expect us back by 2.00pm. On speaking to the tour guide, he said it was a min of a 7 hour tour. We requested to be returned to our hotel and not visit the beach, which we kindly arranged but for an extra cost of 50MR. This was our first Viator tour, booked at the last moment, due to a cancellation of another tour, I do not believe we will ever do another one, with all the information being provided, to be so incorrect. This was a great experience. Leaders we had two for different parts of the tour were both informative and cheerful. Saw lots of different species of animals and birds. We had heavy monsoon rains during our trip but apart from becoming saturated did not detract from the tour. Take a plastic poncho but prepare to get wet! Food for lunch was scrumptious. Fish farms were interesting. This is a must in Langkawi ! Fabulous day. The pickup was without problem and our guide for the day Cairo was excellent. Great sense of humor and helped to make the day fun. We saw everything as stated and enjoyed it all. Lunch was fine and vegetarians were catered for. Overall, a day to remember. We had an excellent, informative and humorous guide. Seeing monkeys, bats and eagles is guaranteed. 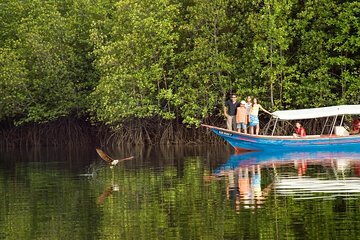 The whole program is like a big boat ride with many stops, for example a bat cave, two fish farms, monkey-riverbank, white sand beach and lunch at a floating restaurant. The mangrove forest itself and the rock formations are wonderful. The trip also included some serious speeding with the boat which is insanely fun :. There is also some free time on a beach, so if you want bring your swimsuits as well. I find the price a bit high though. Worth every penny, the best trip to do. A total Must Do! Definately see this, you never know what you will see. On this occasion besides monkeys stealing food from people on our boat we got to see a Female Green Viper hanging around a tree branch. This was great from beginning to the end.